Does the “beautiful” serve the woman or does woman serve the “beautiful”? 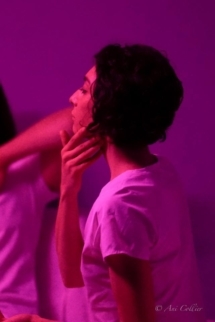 This paradoxical question is the starting point in Miroslava Zahova’s performance, in which she deals with the borders of perceptions about the beautiful body. It becomes a flat plane mirroring the contemporary moral foundations and the concepts of aesthetics and beauty related to them. What is it that defines the body as “beautiful? And when does it become “ugly”? Do we honestly answer these questions? Aren’t our answers too filtered and charged with triviality? Miroslava Zahova graduated in Modern Ballet from the National School of Dance and Dance Theatre at the New Bulgarian University in 2016. 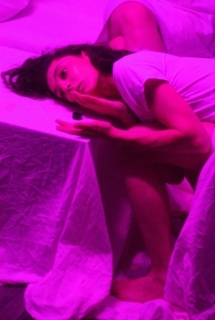 She entered the professional dance stage by solo performances in “medea” and “Salome” by choreographer Miroslav Yordanov and attracted attention for her characteristic expressiveness and plasticity. She has participated in a number of theatre and dance performances, such as “History of Yesterday” with choreographer Galina Borissova, “My Life! Having a Left Thumb” dedicated to a physically disabled actress and directed by Vazkresiya Viharova, etc. She has participated in workshops by Ivo Dimchev (“Do Yourself а Favor”), Doris Uhlich (“more than naked”), Christian Bakalov (“PURE, small future”), Kevin Jean (“Some Other Paradises”), Co-Teaching with Dejan Srhoj, Gisela Müller and Rosen Mihaylov, for site-specific theatre, etc. “Madam Kiflà” is her debut performance as an author. A production of “The Mighty Mighty Pressure Cooker” in partnership with Etud Gallery. 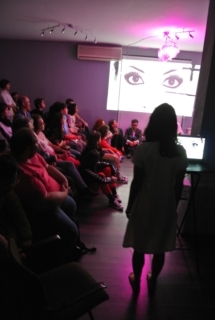 Supported by the Bulgarian Ministry of Culture and Ridacom, a biotechnological company.